The commission will conduct spraying on September 16 from 2 to 6 a.m. in the following Audubon Park, Oaklyn, Collingswood,Haddon Township, Hi-Nella, Voorhees Township and Waterford Township. In Voorhees specifically the commission will spray Merryton Street, Festival Drive, Lucky Court and John Connolly Park. -Swimming pools are a common problem. All pools must be checked and maintained to keep them mosquito-free. Swimming pools can breed mosquitoes within days after you stop adding chlorine or other disinfectant. Pool covers can catch rainwater and become a mosquito development site. Add a little chlorine to kill mosquitoes. 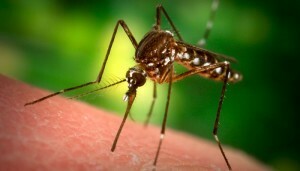 -Maintain screens to prevent adult mosquitoes from entering your home or business. -Personal protection is strongly urged if you are outside when mosquitoes may be active — generally dawn and dusk. Insect repellants containing between 10–35% DEET are very effective, however, be sure to follow the label directions and take extra precautions with children and infants. -Dispose of unnecessary containers that hold water. Containers you wish to save turn upside down or put holes in the bottom so all water drains out. -Lift up flowerpots and dump the water from the dish underneath every week. -Stock fish or add mosquito larvicide to ornamental ponds. -Change water in bird baths, fountains, and animal troughs weekly. -Screen vents to septic and other water tanks. -Store large boats so they drain and small boats upside down. If covered, keep the tarp tight so water does not pool on top of the tarp. -Do not dump leaves or grass clippings into a catch basin or streams. -Do not allow water to collect on sagging tarps or awnings. -Do not allow trashcan lids to fill with water. -Check downspouts that are able to hold enough water to allow mosquito larvae to mature.